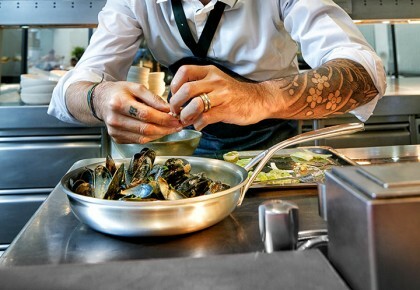 Demeyere frying pans are extremely high-grade, not just in terms of the appearance, but also in terms of delivering high quality. Pay attention to the following care instructions to maintain the optimum durability of the materials and ensure that you can enjoy your frying pans for many years to come. Tip Oil, butter or fat-free? When frying in a stainless steel pan, it is important to use the correct fat. It is best to use butter, margarine or oil that is suitable for frying at high temperatures, such as peanut oil or corn oil. Virgin olive oil ("extra virgin") is not recommended because the natural flavour and aroma of the oil burns too quickly and forms a sticky film on the frying pan. If you still want to use olive oil, please use refined olive oil. Step 1: Put oil, butter or margarine in the pan, on a high heat. Step 2: Before the butter turns brown or the oil starts to smoke, reduce the heat by 30 to 50%, depending on the type of cooker and the power. Step 3: Wait for ten seconds and put the food in the pan. Step 4: Let the food sear thoroughly and turn it over. Step 1: Heat the frying pan on a high heat. Step 2: The drop test: Pour a few drops of water into the pan. 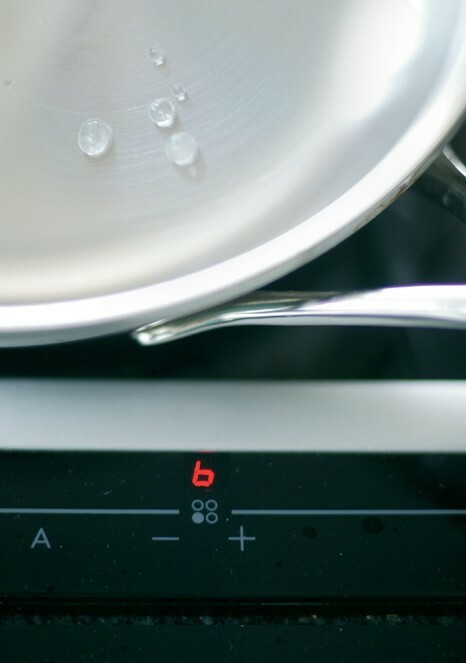 If the water droplets form small beads in the pan, the right cooking temperature has been reached. When the correct temperature has been reached, reduce the heat of the stove. Step 3: Place the ingredients in the frying pan and gently press them down. Take care not to turn the ingredients in the pan too early. The ingredients will loosen by themselves after a few minutes and can then be turned easily. Repeat this process until the desired degree of browning is achieved. Always put the frying pan in the middle of a hot cooker plate that fits the base diameter of the pan. Especially with induction hobs where the cooking zones are not always marked, it is important to put the frying pan in the centre of a coil. Check first exactly where the inductors are by consulting the technical drawing of the induction cooker. 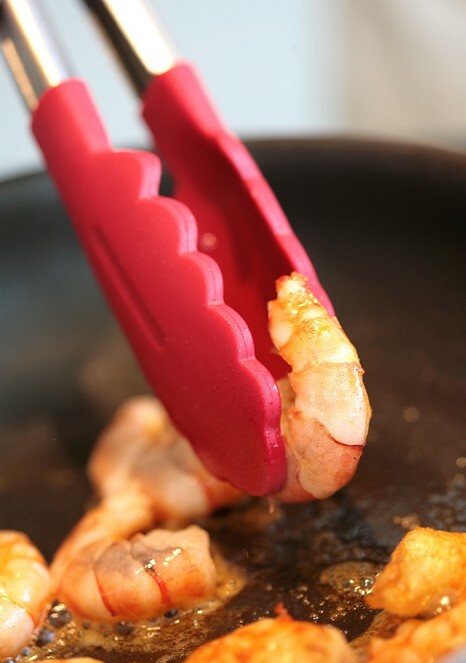 To avoid local overheating, we recommend not using a frying pan with a diameter of 28 cm or 32 cm on inductors with a diameter of less than 18 cm or 22 cm.